This work, Caribbean Steps, is what I am calling a 'hybrid' or 'fusion'. The basis was a really low resolution digital picture taken in low light. Not a great shot by any stretch of the imagination. I cleaned the shot up in Photoshop, fixing all of the usual things; brightness, contrast, hue and saturation, until I got a photo that was better than the original snap. Then I manufactured an HDR set of pictures, using the RAW exposure settings and saving them off so the exposures were ranged from -1.0, to 3.0. I generated the HDR in Photomatix and did the Tone Mapping, leaning somewhat more to the 'overdone' side of HDR - clearly a bit more surreal than the actual scene - and a lot brighter. Once I had this, I picked the color palette, and saved that and I rendered a simple B&W sketch in Photoshop from the HDR photo. I painted the sketch in sticking to the color palette using primarily watercolor and texture brushes. 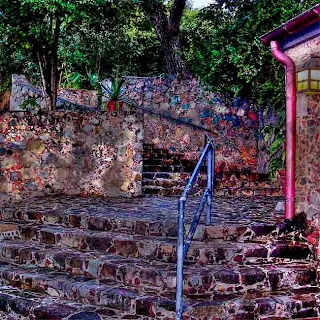 Once that was done, I masked in the HDR shot using a texture brush, with the painting to emphasize some of the more detailed elements of the scene (flowerpot, drainpipe, lantern) to allow these to be more realistic than the 'stained glass' painting effect on the rest of the scene. By the way, the original shot was taken at a restaurant in St. Thomas, at The Old Stone Farmhouse, at around 8pm in December. The colors were all there in the stones, but were far more muted, particularly given the light. This is how I imagined the scene should look in full daylight.